You have heard it said that weak muscles lead to back injury. There is some truth to that statement. You have also heard that having good core strength will prevent back injury. Again, there is some truth to that, but it’s not all about core. Your core is half of the equation. Your back being set in “Neutral Spine Position” when you bend and lift, is the other half of the equation. 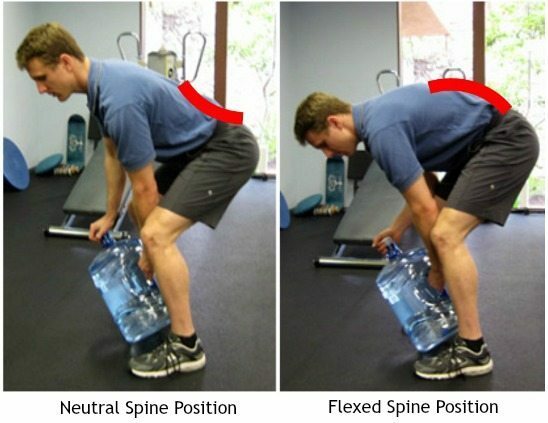 Neutral Spine Position – The key to preventing back injury is maintaining a neutral spine position (pictured on the left). Neutral spine is the natural position of the spine when all 3 curves of the spine — cervical (neck), thoracic (middle) and lumbar (lower) — are present and in good alignment. Keeping the back in neutral position during bending and lifting makes it virtually impossible to injure the back. Flexed Spine Position – It is very common for people to lift with a flexed spine position, in other words, while bending the low back (pictured on the right). This position actually shuts off some muscles that would otherwise stabilize the spine. This is why a flexed spine position during lifting is almost always associated with lumbar disc herniations (aka disc bulge) and lumbar sprain/strain injuries. Think of your back like a door, and think of your core like the lock. 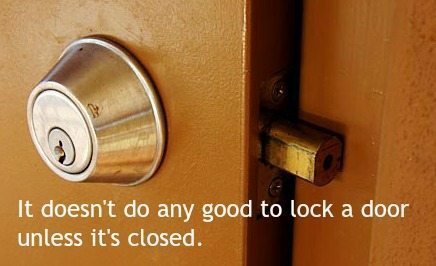 In order for the lock to work the door must be closed because it doesn’t do any good to lock a door unless it’s closed. Your back is the same way, in order for your core muscles to prevent back injury, your spine must be in neutral position. 1. Shut the door, i.e. make sure your spine is in neutral position. 2. Lock the door, i.e. set your back by contracting (or stiffening) your core muscles. The order of these steps is very important. Contracting your core muscles when your spine is flexed is like locking the door after its open. Strong muscles alone will not protect your back from injury. An awareness of neutral spine position combined with contracting your core muscles will maintain neutral spine which will protect your back from injury.